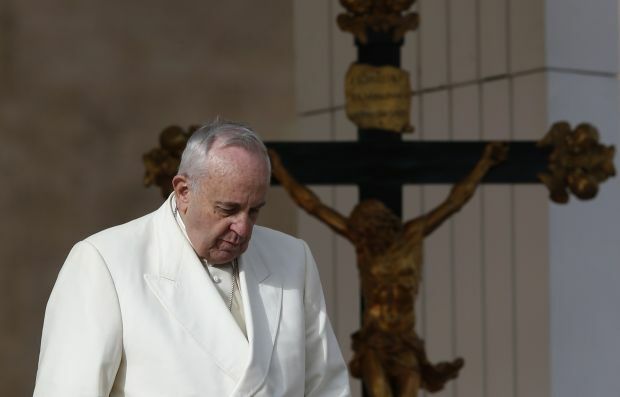 VATICAN CITY (CNS) — It is the complete disregard for God, not his glorification, that leads to violence in this world, Pope Francis said. That is why people of faith, particularly Christians and Muslims, must work together for peace, and governments must guarantee full religious freedom for their citizens and religious communities, he said Dec. 3 at his weekly general audience. The pope dedicated his general audience talk to a few of the highlights and hopes from his trip to Turkey Nov. 28-30. The importance of religious freedom, he said, was the focus of the first day of the trip when he met with government authorities of the Muslim-majority nation with a constitution affirming the secular nature of the state. With government leaders, he said, “we talked about violence and how it is precisely forgetting about God, not his glorification, that generates violence. “That is why I insisted on the importance of Christians and Muslims working together for solidarity, peace and justice, underlining how every nation must guarantee citizens and religious communities real freedom of worship,” he said. “Dialogue is the path of peace,” he told them, according to a Vatican statement. Prayer, on the other hand, is the foundation and path of Christian unity, the pope said in his audience talk, adding that ecumenism was another major focus of the trip. Mass in Istanbul’s Cathedral of the Holy Spirit brought together Syrian, Armenian and Chaldean Catholics, as well as members of the Latin-rite church. A number of Orthodox dignitaries also attended the Mass, including Orthodox Ecumenical Patriarch Bartholomew of Constantinople, as well as representatives of Istanbul’s Protestant communities. “Together we invoked the Holy Spirit, who is the one who brings unity to the church — unity in faith, unity in charity” and unity within hearts, he said. Pope Francis said it was “particularly significant” that after praying together at a liturgy for the feast of St. Andrew, he and Patriarch Bartholomew signed a joint declaration to continue working toward full communion between Catholics and Orthodox. The feast day was an ideal occasion to “strengthen the fraternal ties between the bishop of Rome, the successor of Peter” and the patriarch, whose church was founded upon the tradition of the apostle Andrew, Peter’s brother. He thanked Turkey for welcoming so many victims of war and conflict into its country and he thanked those religious communities working to help them. NEXT: Faith groups ‘key’ to fighting Ebola, says U.N.